Happy holidays! This is Marc Hershon, executive producer of Succotash, the Comedy Soundcast Soundcast. And we’re pleased to pass along this Succotash Extra from our sponsor, Trumpoetry.com, as read by our booth announcer, Bill Heywatt! On behalf of our host Tyson Saner, our producer/engineer Joe Paulino, and everyone at Succotash Headquarters, Merry Christmas and Happy New Year! Saluton and Happy "Things That Are Done at This Time Of Year" to you! Estas mi, your host Tyson Saner, and welcome to the last epi of Succotash, The Comedy Soundcast Soundcast, of 2018. ANYWAY…It's a show chock full of content including clips from Chillpak Hollywood Hour, Just Say Words, 2DudeReview, Conan O'Brien Needs a Friend, The Podcast Brothers and Thought Spiral. We've also got a very "This Time Of Year-y" Henderson's Pants ad from waaaaay back in 2012 (I think) and, of course, a reading from our most recent sponsor, TrumPoetry.com. Listeners of past episodes of Succotash might remember the soundcasts Trevor Has Friends and Just Joshin' being featured in episodes 172 and 177, respectively. These are both comedy soundcasts from over at Savage Henry Magazine , a humor magazine produced locally here in Humboldt County. It's a free publication that has been published with regularity since it was first published in 2010. It was founded by Chris Durant, Sarah Godlin, Monica Durant, and Josh Duke. I follow the magazine on Instagram at @savagehenrymagazine and I came across this post from December 16th, 2018: "Monica, (@moneycuz) co-founder of the magazine and the glue that has kept it all together for all these years, is sick. She can use your help if you're in position to do so. She's dealing with liver failure and is facing a transplant. Links to donation sites in comments. Thank you for being a fan of Savage Henry and your support." It's a modest goal of $10K and if you're wondering about specifics, on the page I just specified there was an update made on December 16th, 2018 which reads: "Wow everyone. I'm am so relieved by the outpouring of help in so many forms. This is a crazy time. A major surgery, a month or more of intensive therapy and monitoring, a year till projected recovery, and a lifetime of medications are daunting goals and having some weight lifted financially is a HUGE COMFORT!!! Thank you." 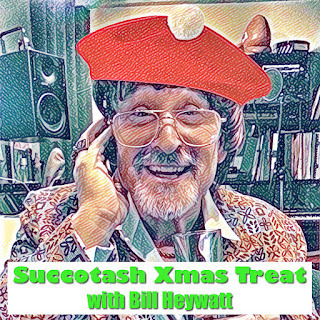 This soundcast features two members of "soundcast royalty" (as dubbed by Succotash executive producer Marc Hershon), namely Dean Haglund and Phil Leirness. They've been doing the show for more than 11 years, week in and week out, engaging in thought-provoking, insightful, and irreverent cultural conversation. Our clip is from recent Epi603, where the gents discuss the death and life of U.S. President George H.W. Bush, the forthcoming film Vice, the live variety stage show Phil produced on his 50th birthday, Dean's efforts to pack up his L.A. abode and his recent Michigan adventures. There's also a plug for their dark comedy The Lady Killers. P.S. I've seen "The Lady Killers" and it is quite good. We're working on having Dean and Phil on as guests to talk more about The Lady Killers on an upcoming edition of Succotash Chats! Comedians Andy Kindler (Bob's Burgers, Maron, and a past Succotash guest) and J. Elvis Weinstein (MST3K, Freaks & Geeks) convene weekly to solve the problems of the world but usually end up talking about comedy and various forms of anxiety. Every episode so far has been called "Test Episode Number Something". Our clip hails from their Epi64, a live show from the Improv Lab in Los Angeles, where Andy muses on the pros and cons of singing in public and which musicals he has enjoyed. Sidenote: The documentary: I Need You To Kill, features comedians Pete Lee, Chad Daniels, and Tom Segura on a comedy tour of China. It turns out that there's a growing comedy scene over there and it's fascinating to see it happening. The documentary was directed by none other than the aforementioned J. Elvis Weinstein. It's currently streaming on Amazon Prime and, assuming you are a fan of comedy and/or documentaries about comedians or just documentaries in general…you could do a lot worse than to check this one out. Flaw700 and Fresco are two real life brothers who are similar (because they're both Gemini's) but also have different view points. The authentic and entertaining sibling dynamic gets switched up when Kailah King is there, She offers a unique female's perspective. They discuss mainstream hip hop events and relay those events into engaging topics of discussion. This clip is from "Love Is Free", their Epi110 from this past November, and is part of their segment called "Fresh or Fiasco". The Just Say Words soundcast covers everything from social Issues, pop culture, and race, to tech, movies, and much more. Hosted by Jae, in Epi239 he talks about voting and has a bunch of random ramblings filled with jokes and much more. Our clip features him detailing how he dealt with his Netflix account being hacked. The 2DudeReview is a weekly podcast, hosted by Brian Bradley and Chad Hamilton, features Karina Dolehide, and is based on the book, "1001 Movies You Must See Before You Die." Brian and Chad are longtime friends and lifelong movie geeks who love to talk, at length, about their favorite films. "Each week we watch a movie from the '1001 Movies' list, research the film, then discuss and rate the movie from our perspectives. We pride ourselves on bringing quality content and maybe even a laugh or two in the process." IN November, they talked at length about the movie Jurassic Park — what the hell genre is it, science versus religion versus capitalism, and Chad has the hiccups. Our clip catch the hiccup fit. After 25 years at the Late Night desk, Conan O'Brien realized that the only people at his holiday party are the men and women who work for him. Over the years and despite thousands of interviews, Conan has never made a real and lasting friendship with any of his celebrity guests. So, he started a podcast to do just that. He's joined on this quest by longtime trusty assistant Sona Movsesian and producer Matt Gourley (Superego, James Bonding.) His very first guest was Will Ferrell. In our clip from that episode 1, Will recounts a long-running "life bit" that involved a costume from a "Smokey and the Bandit" sketch on SNL. And just like that, the last Succotash show of 2018 is drawing to a close. What a year it has been. I've spent 10 months of it putting together episodes of this show and eight of those 10 months preparing to welcome my wife and I's first child into this world VERY early in 2019. Also, the 16th of this month was my wife and I's 15th wedding anniversary. For those of you who pay attention to this sort of thing, 15 years is the "Crystal" anniversary. Anyway, 2018 has been the most unique year of my life so far. I have a feeling 2019 is going to top everything on the uniqueness scale...if there is such a thing. On January 1st I have a single dropping. It's a collaboration with Korey Epps who appeared in the Chats episode of Succotash #175. He has an album coming out in early 2019 called "Luv & Liquor" and our collaboration is part of it. It's called "Hope" and it will be available on New Years Day, on Spotify, iTunes/Apple Music, Amazon, Google Play, Deezer, Tidal, Napster and Youtube.…so that's happening too. In closing, thank you to my wife and family for being wonderful and supportive of me all these years. Thank you to Korey Epps for believing in my musical ability enough to collaborate on a music project with me. Thank you to Executive Producer Marc Hershon for keeping the show running for all those years and then deciding that when he was ready to pass the torch to someone that I was the man for the job. Thank you to Will Durst for contributing the very best in Moderate Political Comedy…that's what it's called, isn't it? Thank you to Bill Heywatt for announcing the show and thank you Joe Paulino for making sure Mr. Heywatt is always captured at his best. Thank you Scott Carvey for the Succotash theme music you are hearing in the background. 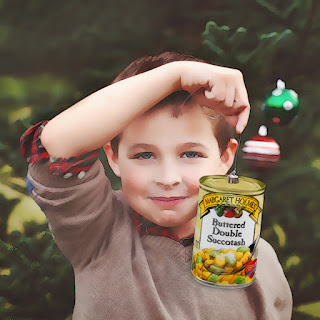 And, of course, thank YOU the listener …for listening…and for sharing us with others for that is what we mean when we gently implore you to please pass the Succotash! 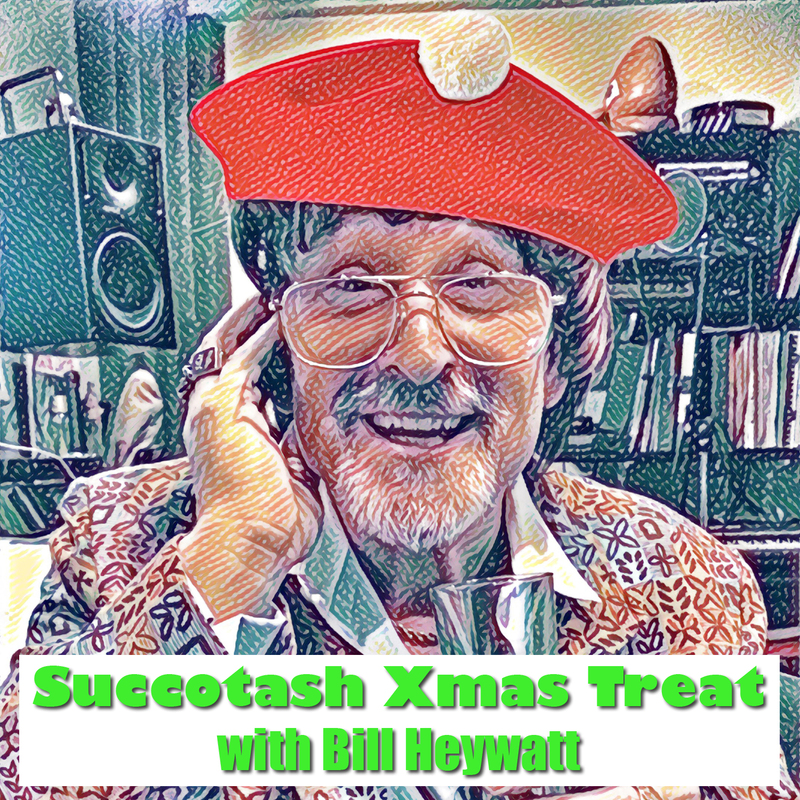 Saluton, estas mi Tyson Saner, your host for this early December holiday season edition of Succotash, the Comedy Soundcast Soundcast, and have I got clips for you! Have I got clips for you? Of course I do — this is a clips addition of Succotash. It would be misleading and, frankly, weird if I didn't. I've got clips from: Maltin on Movies, Christal Clear The Podcast, Master Manual, High Content Pod, Unstructured, Shenk, and Weird Adults with Little Esther. We've also got a double dose of raging moderate Will Durst's Burst O' Durst segment. Plus a reading from the website of our still-fairly-new sponsor TrumPoetry.com. Harmontown's "Dungeon Master to the Stars" Spencer Crittenden and game designer Cohen Edenfield discuss the finer points of leading a role-playing session in this surprisingly accessible advice show. Our clip is from the inaugural episode of Master Manual. In the episode, Spencer and Cohen answer questions and riff up a fresh new take on vampires, while the clip is from a segment called "Alternate Monster Lore". This soundcast should perhaps be entitled Maltins On Movies, as legendary film critic Leonard Maltin AND his daughter Jessie are the ultimate movie fans. They love talking about movies, especially with people who share their enthusiasm. In the epi released on November 2nd this year, their guest was comedian Dennis Miller, who is a diehard film buff. In the snippet we feature, Dennis recounts a past encounter with Leonard Maltin seasoned with references, and a discussion of The McCarthy Era of Hollywood History, as well as the beginning of a discussion about character actors. Unstructured is a chat with people who are changing the world around them, through teaching, creating, or just living as an example. And when meeting folks, we can learn from each other, be inspired, and maybe even make a new friend, together. OUr clip is from Epi84 of the show, which dropped on October 25th of this year and featured Susan Bennett, who furnished the original voice of Siri, Apple's voice UI. She describes the recording process that when into creating Siri's voice. Comedian Sara Weinshenk interviews comedians, musicians & artists living in LA. Topics include food, fashion, cannabis & comedy. The clip we're featuring comes from the episode entitled, "Mango Juul Pods, Snail Essence & Feet Pics W/ Comedian Brandon Wardell", from this past November. Sara and Brandon yack about fashion and speculate on life as a gamer. "Little Esther" Povitsky finds out what makes her fellow comedian friends both weird and adult with an irreplaceable quirk and charm not found anywhere else. This show seems to have largely gone away but it popped back on the radar last March following a live edition performed as part of the San Francisco Sketchfest. Esther was joined by Nick Wiger of Doughboys soundcast fame where they mostly talked about food. In the clip, the host mentions she has jaw pain and that leads to a conversation about strange interactions with a few medical professionals. Seeking clarity in life, to make the most of my life. "Christal Clear" is my affirmation. Our clip comes from the "Be My Guest" episode from last October, where host Christal discusses the adjustments one makes when one receives feedback on their shows and guest Jae (who has been running the Pod Dealer Network for almost a year as of this recording) explores the anxieties of being the sole host of a show. Hosted by Iraj Lopez and Joe Buratti, High Content had its first live episode last month at the Savage Henry Comedy Club in Eureka, California. After local comedians Jessica Grant and Nando Molina gave interviews the hosts of HiC unexpectedly invited me up on stage for a segment. Here is a bit that I clipped off for you from the "Would You Rather" portion of the interview. And there you have it... or rather here you had it... "it" being another "Succotash The Comedy Soundcast Soundcast" clips edition... ...that is still underway now that I think about it so (ahem) here you are having it, another edition of "Succotash The Comedy Soundcast Soundcast". If you are listening…we also love those who don't listen as long as they are also reasonably good people…and by "We" I mean "Me". I need to clarify that because I don't wish to speak on behalf of other people when it pertains to love. It's not a healthy habit to get into…and as an expectant father I need to maintain my health in as many areas as I can.